Small and unimpressive at first sight, fire-bellied toads don’t immediately seem to be comparable to various exotic, exquisite, and costly amphibians many hobbyists enjoy to keep and proudly display to visitors. Yet, well-informed enthusiasts understand the secret of their extreme popularity, which doesn’t seem to be affected by the fact that these little pets are considered boring and unchallenging by many. Indeed, fire-bellied toads are quite sought-after species of the amphibian world, and for a good reason: they are easy to keep and their cheerful presence, active temperament, and inquisitive nature can bring hours of hassle-free fun to their owners. 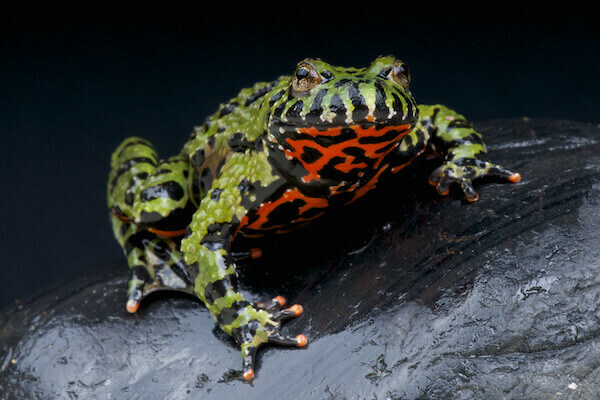 What is a Fire-Bellied Toad? 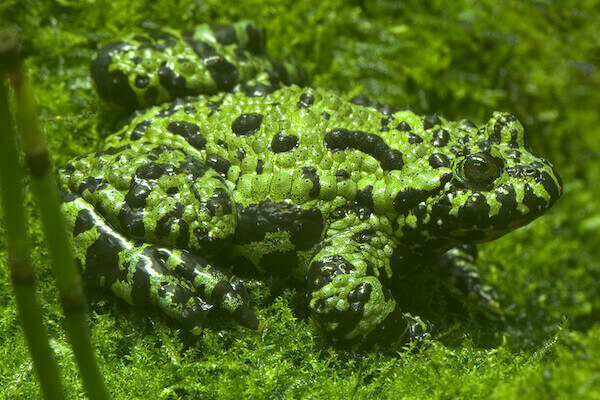 Belonging to the genus Bombina, there are eight, geographically somewhat diverse species referred to by this name: Bombina orientalis – the Oriental fire-bellied toad – is the most popular species amongst them in the United States, while their European relatives are somewhat harder to come by in pet stores, and are distinguishable from the Oriental fire-bellied toads by their lighter orange to yellow and black colored bellies. As their name suggests, Oriental fire-bellied toads are originating from Asia: they are commonly found in Korea, China, Japan, and parts of Russia. Typically green and black on their backs, their undersides are fiery orange and black, making these little creatures easily noticeable -and as such, avoidable- to predators. Toxic secretions are produced by their skin, making them practically safe from other animals that are on the hunt for food. They are characteristically on the smaller side, rarely growing much larger than 2 inches in length, remaining lightweight -usually a few ounces at most- their entire long lives. Indeed, these creatures can live quite long, easily surviving 10-15 years or beyond, especially in human care. Being diurnal, fire-bellied toads tend to be awake during the day, making it incredibly easy to observe their lively behavior. This quality truly shows just how ideal companions they are compared to many others in the class of amphibians. How to Set up a Toad Habitat? Since fire-bellied toads are semi-aquatic, they require a habitat that is set up with land and water equally available inside the tank. Its size is primarily dependent on how many toads a hobbyist intends to have: a ten-gallon tank is sufficient for up to five kept in each; a twenty-gallon size is ideal for larger groups, or for having a more impressive habitat on display. It is recommended to keep several of them in a colony: they are happier, more active, and it is more entertaining to observe their interactions as well. It is important to keep in mind that fire-bellied toads prefer cooler temperatures: mid-70’s is ideal during the daytime, but since they are incredibly hardy, they are perfectly capable of tolerating temperatures in the lower 60’s overnight. Additional heating is usually not required, unless there’s a risk of significant temperature drop. On the other hand, good lighting is very beneficial, encouraging fire-bellied toads to display more activity during the day. A good rule of thumb is to always use fluorescent lightbulbs, or other, low UV light sources to avoid dangerous overheating-related health problems. Fire-bellied toads prefer humid, moist environment and substrate. 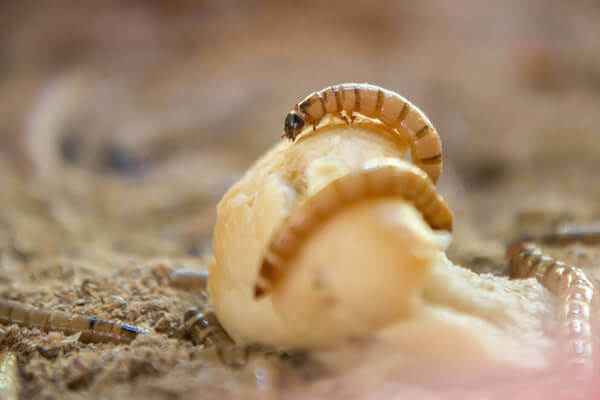 Coco husk is an ideal choice to provide them with a deep terrain that allows them to burrow inside, while live moss and some plants could further enhance their habitat. A couple of strategically placed rocks provide the colony with an ideal resting place, creating an impressive and lush vivarium. Water should be no deeper than 1-2 inches, and always pre-filtered to remove dangerous chlorines and other chemicals present in tap water. A screened lid is an important addition to keep fire-bellied toads from escaping, and completes the set up of the habitat. Fire-bellied toads are hardy and robust creatures: they are incredibly easy to care for. Daily replacement of water is ideal, while spot cleaning can be performed every 2-3 days to remove food debris. A thorough cleaning, paired with complete sterilization of all items in the habitat, is necessary on a monthly basis. After transferring toads into a temporary tank, reptile-friendly disinfectant should be used, making sure that all remnants of chemicals are carefully removed before the habitat is set up again. How to Feed Fire-Bellied Toads? There is a great variety of invertebrates that fire-bellied toads enjoy consuming: recently fed young crickets, locusts, earthworms, waxworms, small spiders, and flies are all part of their typical diet. 3-5 insects should be counted per toad and per feeding, which should happen no more than 2-3 times each week. Toads are known to have large, nearly unsatisfiable appetites, therefore mealtimes should be closely observed to ensure that all pets receive their equal share of food. It is important to avoid feeding them shelled insects, since these are difficult to digest and could potentially lead to health problems. Supplementation of food is vital: calcium-rich vitamin powder should be dusted on their food once a week, to ensure perfect health and longevity. Other vitamins, such as vitamin D3 should be considered as well, since it’s very beneficial for optimal bone health. A healthy animal has smooth skin, bright eyes, clear nostrils, and no sign of mites. An exotic pet veterinarian should check toads each year to make sure they remain at optimal health throughout their lives. It is a good habit to keep a detailed diary of care, it could help to pinpoint environmental factors when signs of problems arise. The contact information of an exotic pet veterinary should always be readily available, as some of the above symptoms could be sign of dangerous, possibly fatal problems. It is important to be observant, handle fire-bellied toads with care, and to take notes of unusual issues detected. A well-educated, aware owner is the key to keep these curious, interesting, and fascinating pets healthy for many years to come.